Once again, they kept me sweating it right up until the end, but the Packers pulled out a win in Philly tonight and advanced to the next round of the playoffs. 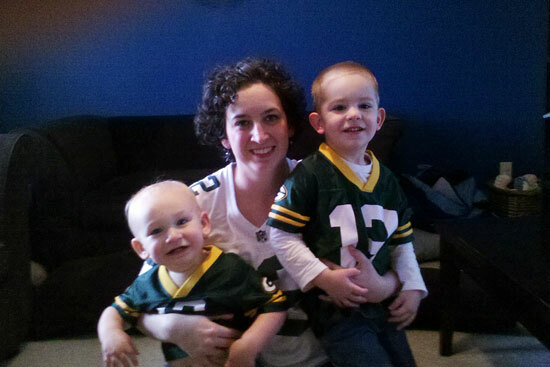 Almost as wonderful as the win was getting this photo with my phone of my boys and I in our Aaron Rodgers jerseys. Sure, it was taken with my phone so the lighting is too dark, the grain is super noisy, and Micah is a little blurry. Still, I love it. They're both looking at the camera and aren't trying to slap one another for a change. I know I haven't been blogging much lately. Truth be told, it's probably better that way since I haven't really been all that much fun to be around in person. Despite the fact that the Packers just pulled out their first playoff win without Brett Favre since before I was born (FACT), I am on edge. I suppose it's just been that kind of week where a lot of things have been piling up on me at once. I realize I'm being about as eloquent as stuttering sloth right now, but it's the best I can do. I'm due to write you an update on our Total Money Makeover, but I'm hiding like a rodent in its hole because frankly, our progress has been less than impressive as of late. We're struggling to get a handle on how to move forward into a new year that is complete with a whole new set of challenges. I don't have any scrapbook layouts to show you because I haven't been able to work on any since November. Long story short.....I need to get a handle on things. I'm confident a victory in Atlanta will help with that. Go Pack Go! Random note - I saw Black Swan with my sister-in-law the other night and it was AMAZING. Psycho, crazy, and creepy, but super good.